People who know how essential this item is for spiritual, mental and physical well-being need no reminder, and for those who are yet to find out, no brief description on Etsy can suffice. The full 3 metal astrological yoga bangle may be the very most important item in this shop. Significantly thick, this bangle is composed only of strands of 24 kt gold, 99.9%+ fine silver and 99.9% copper, each of the same specific weight of 1.08 troy ounce. The length starts at 13 inches but shortens upon twisting. The actual final bracelet length after being made will be somewhat reduced from the initial length, typically by 10% or less. This necessary shortening has to occur as the wires wrap to create a relatively thick chord. Thus, the final length is approximately 11.7 inches long. You will be the first person to ever wear it. By telling us the size of the location (inches or cm around upper arm; the wrist is not a recommended location due to the sheer size of this bangle), we can shape your bangle to your size. Postscript: Common questions have been coming up of the actual amount of metal in the bangle and how one may expect any results if we make it. This tells me that I am not giving a full enough description. As the price for the full one here is 1/5 or more off of the "regular" bangles, there is the same amount of gold. That is to say, there is actually 1.08 troy ounce of 24 kt gold in this full bracelet. 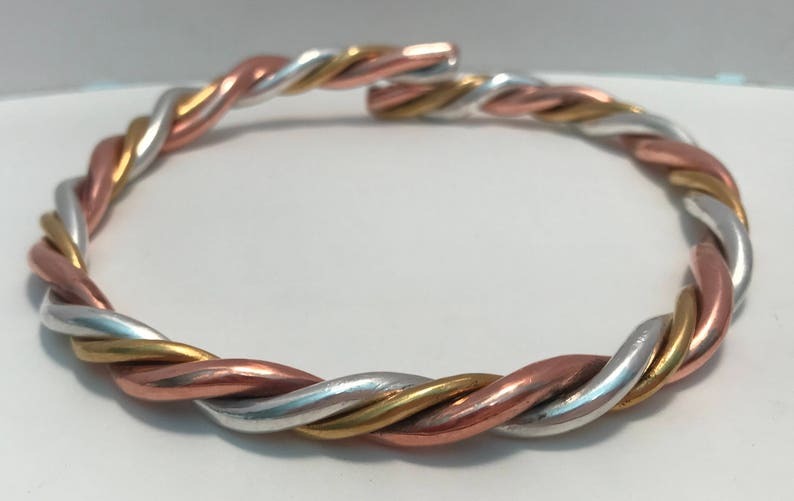 The weight of fine silver and copper in the full bracelet are each approximately the same as well to allow for equal specific weights while still being significantly more affordable. IMPORTANT REMINDER: the 13 inch length actually is for the wires used before twisting, The final bracelet length will be somewhat reduced, typically by 10% or less, to a length of about 11.7 inches. I love what the SRF do, are, and represent and do not want to take a penny from their treasury. 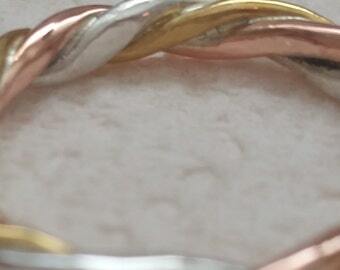 This bangle is just another option for the 1 oz each of 24 kt gold, fine silver, and copper.